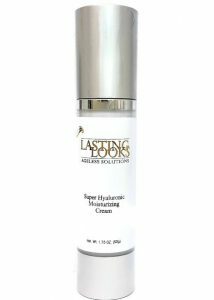 Ageless Solutions Super Hyaluronic Cream combines the highest concentrations of Hyaluronic Acid, Squalane and Aquaxyl TM. It is the ultimate nourishing cream for smoother, softer, younger-looking skin. What is Hyaluronic Acid? Hyaluronic Acid is naturally found in the space between the cells of your skin. It is what our collagen floats in. One of the most important functions of hyaluronic acid is to retain water. A role based on its capacity to hold 300% more water than any other natural substance known to man. The aging of human skin is accompanied by the decline in the hyaluronic acid content, resulting in a loss of elasticity visually known as wrinkles. Hyaluronic acid is very rarely used in moisturizers due to high market cost. It is because of this that it is used in very small amounts. We offer high percentages in our solution.